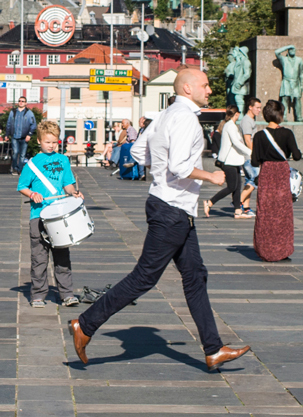 Sound intervention Heredrum focuses its attention on the imperceptible and hidden rhythms of everyday walking by attentively observing, capturing and performing these rhythms on the spot of their occurrences. A group of drummers with snare drums attached to their waists walks on a populated public square in an urban setting and spreads evenly in a large formation sometime in the afternoon. Each drummer focuses on the steps of a random passer by, hitting the snare drum every time the foot of the observed person touches the ground. When the observed walker has left the square or the steps are out of sight, the drummer pauses for a short time and focuses on another passer by. Heredrum is a part of artistic research project Rhythms of Presence.